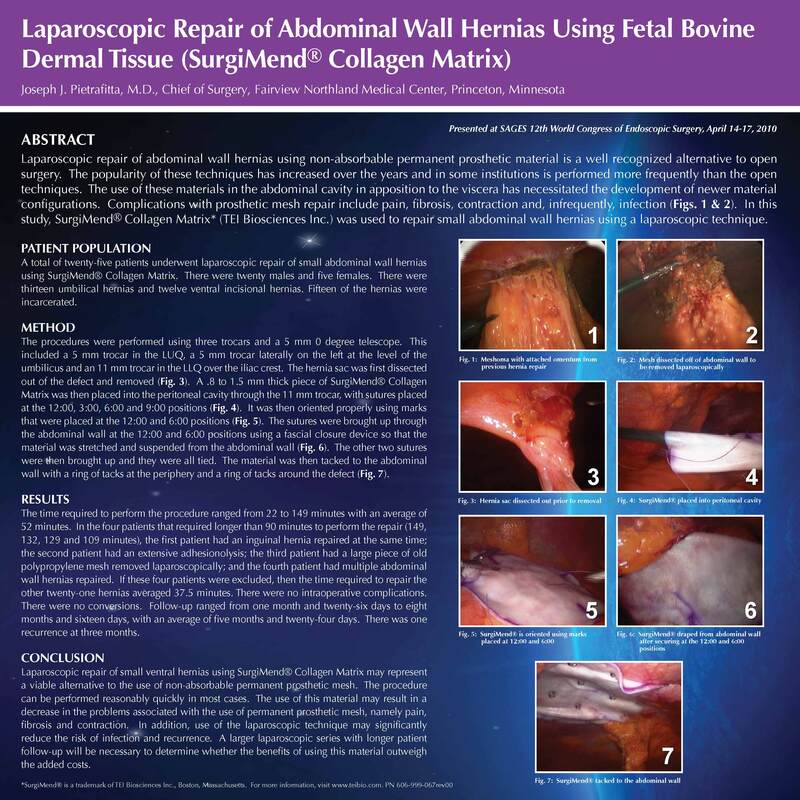 Laparoscopic Repair of Abdominal Wall Hernias Using Fetal Bovine Dermal Tissue (surgimend). Laparoscopic repair of abdominal wall hernias using non-absorbable permanent prosthetic materials is a well-recognized alternative to open surgery. The popularity of these techniques has increased over the years and in some institutions is performed more frequently than the open techniques. The use of these materials in the abdominal cavity in apposition to bowel has necessitated the development of newer material configurations that prevent adhesion to the prosthetic materials.A number of devices have been developed to secure the materials to the abdominal wall. Complications associated with prosthetic materials are seen and include pain, fibrosis, contraction and infection. The prosthetic materials that are currently being used as well as the devices used to secure the materials are still being refined. In this single surgeon study fetal bovine dermal tissue with a nominal thickness of 0.8-1.2 mm (SurgiMend), TEI Biosciences, Boston, MA) was utilized to repair hernias of the anterior abdominal wall. All of the procedures were performed using the same technique. A pneumoperitoneum was achieved with a Verrhes needle introduced supraumbilically or in the LUQ. Three trocars were then placed. A 5 mm trocar in the LUQ laterally, a 5 mm trocar at the level of the umbilicus laterally on the left and an 11 mm trocar in the LLQ laterally over the iliac crest. The material was introduced with 4 sutures attached at the 12, 3, 6 and 9:00 position. The sutures were brought out through the anterior abdominal wall with a suture-grasping device and tied. The material was then secured to the abdominal wall with spiral tacks. Tacks were placed in the perimeter of the material and in a ring around the defect. From 1/14/09 through 8/4/09 25 abdominal wall hernias were repaired. There were 20 males and 5 females. There were 13 umbilical and 12 ventral incisional hernias. 15 of the hernias were incarcerated. Procedure timesranged from 22 to 149 minutes with an average of 52 minutes.Four procedures required greater than 90 minutes (149, 132, 129 and 109 minutes). The first of these patients had an inguinal hernia repaired in addition to the abdominal wall hernia, the second had an extensive adhesionolysis performed, the third had large pieces of previously placed polypropylene mesh removed laparoscopically and the fourth had multiple abdominal wall hernias repaired. Excluding these 4 patients the time required to complete the procedure was 37.5 minutes including patients with incarcerated hernias. There were no intraoperative complications. There were no conversions. Follow up ranged from 1 month 26 days to 8 months 16 days with an average of 5 months 24 days. A single recurrence occurred 3 months post operatively. On laparoscopy the repair was intact with herniation of the abdominal wall peripheral to the repair. The use of fetal bovine dermal tissue placed laparoscopically may represent a viable alternative to the use of non-absorbable permanent prosthetic materials for the repair of abdominal wall hernias. Larger studies with longer follow up will be required to determine the role of these materials in the repair of abdominal wall hernias.